The Explainer Academy is a project of Common Craft, a company owned and operated by Lee and Sachi LeFever. Common Craft is a small, proudly independent company based in Seattle, Washington. Since 2007, Common Craft have produced short animated videos designed to explain technology and other subjects. These videos, like RSS in Plain English and Wikis in Plain English are now considered the first explainer videos of the YouTube era; ones that started the fast-growing explainer video industry. Common Craft also produced a number of high profile videos that have been viewed tens of millions of times. The video Common Craft created to explain Dropbox introduced tens of millions to the Dropbox website. Common Craft videos have been viewed over 50 million times and licensed to professionals and organizations in over 50 countries. Years of creating explanations and the incredible response we received prompted us to share our know-how and help others become better explainers. 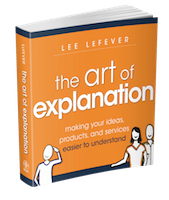 In 2012, Lee published The Art of Explanation - Making Your Ideas Products and Services Easier to Understand, which has become the definitive book on explanation. It has been translated into over seven languages. Read 100+ Amazon reviews. The mission of the Explainer Academy is to help professionals earn influence and attention by becoming more skilled at explanation. Often, these professionals depend on clear, concise communication and include teachers, trainers, instructional designers, attorneys, I.T. professionals and more. We believe that everyone benefits when more people become explainers. The Explanation Master Course is the foundation of the Academy; a comprehensive look at the skill of explanation for any media or situation. The course on How to Produce DIY Animated Videos focuses on turning explanations into animated explainer videos using common affordable tools with quality results. We also offer the courses as a bundle with a 15% discount. Are you interesting in writing about the Explainer Academy or Common Craft? Check out our Media Kit. Today Common Craft is an online service that offers ready-made explainer videos for use in classrooms, in organizations and on the web. Educators and trainers use these videos to quickly introduce new and complex subjects. To further help others become explainers, Common Craft provides access to a library of thousands of downloadable visuals called "Cut-outs". These digital images are designed for use in videos and presentations. Search the complete library here. Through Common Craft and the Explainer Academy, Lee and Sachi are helping professionals become better explainers. If you have any other question or feedback, we'd love to hear from you. Contact Us.